The street-style photographer documented the fashion and humanity of New York City. Bill Cunningham, the legendary street-style photographer whose photo essays were regularly published in The New York Times for nearly four decades, has died today at the age of 87, The Times confirms. He passed away after being hospitalized for a stroke. Cunningham captured styles and trends such Birkin bags and gingham shirts while riding around the city on his Schwinn bike. But he was also a cultural anthropologist, portraying the the larger contexts in which these styles evolved through his photos. "I realized that you didn't know anything unless you photographed the shows and the street, to see how people interpreted what designers hoped they would buy," Cunningham wrote in a 2002 Times essay about his development as a photographer. "I realized that the street was the missing ingredient." Cunningham was celebrated in the 2010 documentary Bill Cunningham New York, which chronicled the photographer's life, work, and stubborn independence. He declined to attend the premiere of the film and claimed until his death that he had never seen it. "Even though his talents were very well known, he preferred to be anonymous, something unachievable for such a superstar," Michele McNally, director of photography at The Times wrote in a statement issued today. 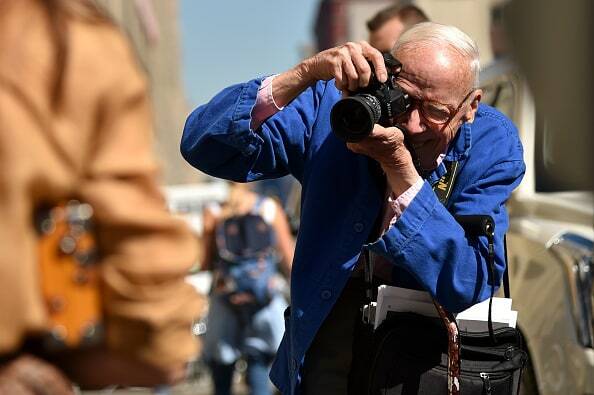 See Bill Cunningham's weekly video series for The New York Times here.